Welcome to Harbor House! Overlooking the Galien River preserved wetlands, this 4 bedroom, 4.5 bathroom home gives the privacy and seclusion you would expect from a nature preserve without sacrificing the convenience of proximity to downtown New Buffalo. Whether you’re catching the sunrise over the river from the vast decks or gathering with family in one of several common areas, Harbor House is certain to be an exercise in relaxation. Our favorite feature of Harbor House is the huge wrap-around deck. It overlooks a huge expanse of preserved wetlands that is alive and vibrant with birds and nature. Spring rentals are awesome as the birds frolic and dance in the air in front of you and this really is a birdwatcher's paradise. This settles down in the summer just a bit and is a great place to sit with some binoculars and enjoy life and soak up the sun. There is a patio set for outdoor dining and multiple lounge chairs as well. The gas grill is also on this deck(we supply the propane), just off the entrance to the kitchen area. The house itself is modern and up-to-date, well furnished and very well cared for by the homeowner, who does spend family time here as well on occasion. Cable TV, high-speed wireless internet, great appliances, and high quality furniture are all part of the package. On the main level, the primary living and sitting room overlooks the preserve. Tremendous windows bathe the home in natural light and seem to bridge the separation between the indoors and the expansive views. The wood burning fireplace offers cozy ambience for those rare cool summer nights and is even better during the spring, winter and fall. The open kitchen/dining room is just south of the living room and has a large dining table for entertaining as well as a breakfast nook and island bar. The first bedroom is located on this main floor, decorated in French country style. It features a queen bed and en suite bathroom with a Jacuzzi tub. This bedroom also opens up directly to the patio if you wish to sneak out at night for a look at the stars. The upper level of Harbor House has a loft office with view over the the living room and out towards nature as well. The second bedroom and thirds bedrooms are on this floor as well. The second guest bedroom has a queen bed and a private shower bathroom, with south facing windows that make use of natural light without serving as a wake-up call at sunrise. The third guest bedroom has a king bed, its own private shower bathroom and direct access to the smaller second floor deck. This cute deck is perfect for enjoying a cup of coffee while watching the sunrise color the sky above the river. The lower level family room is a great place to break off and spend some time. It has a large screen TV and a DVD player and still gets natural light. There is a also a foosball table and this a good space to let the games in your group hook up to the TV. This room provides great entertainment on rainy days. The fourth bedroom is also in this lower level, with a queen bed and access to a full bathroom. There is also a large air mattress in the downstairs closet that you are more than welcome to use for 2 people. There is room for the air mattress in the lower level sitting room as well as the upper level bedrooms. One last fun space to mention - there is a well furnished shaded screen porch that opens to the patio deck, so you can still enjoy the sight and sounds of nature while keeping cool and out of the sun. As for location, you are located at the end of a quiet road with little or no through traffic, but still only a few hundred feet from the Stray Dog Saloon, so you can always call ahead and place an order if you don't feel like using the great kitchen. The New Buffalo public beach is just steps away (800 yards from the front door approximately), and you can walk or drive and park, whatever suits you and your group best. The rest of downtown New Buffalo is equally close as well. John was so nice and so helpful with all of our questions and needs. John was so nice and so helpful!! He always took time to answer all my questions! We had a wonderful time in the big, beautiful home! Jon was very accommodating and understanding. I planned a couples getaway with my sisters and our spouses. We were looking for something not too far of a drive from the Indy area and something that was quiet and relaxing, but with walking access to restaurants, coffee, etc. 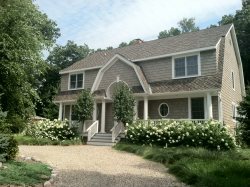 We loved the location of this property as we could walk a block to grab dinner or another block and be at the beach. We did not expect to have this convenient town access and yet our back porch was completely secluded and overlooked a nature preserve. We enjoyed the very short walk to the beach, dinner, spa, shopping, ice cream, breakfast, and David's Coffee. The kitchen overlooks the harbor with amazing views. Secondly, there are 4 bedrooms with Queen or larger beds and each has their own bath making this a perfect home for couples to vacation together and still have their own space. The home has several spacious gathering areas where our group could eat, cook, or relax together. The home is light and spacious and the quality craftsmanship in the home is incredible. The custom live edge woodworking throughout the home is very impressive. The owners have put a lot of love and care into this home and it shows.